On October 20, 2016 – I had a prophetic glimpse – dream. I shared it on my last News from the Wall audio program. For the last few weeks, I did not understand it. But it is now starting to come into focus. If the future plays out according to what I saw, the people of God need to prepare, because a huge crash is coming. …And it is going to include Donald Trump. So I am sharing this information as a warning to the people of God. Please pray about it, and consider it. If God bears witness with you, please act accordingly to prepare your house, your family, and your loved ones for its arrival. The van was traveling in the entrance ramp of a freeway that had two lanes going in one direction. I could not see the opposing traffic. There were also no other cars on the freeway. None. We were the only ones. It was daytime. When we entered the freeway, the driver, who I called, “Uncle Fred,” began to accelerate very quickly. I told him that the van had a brand-new motor and we needed to go easy on it. He floored it. The van accelerated very quickly, and within a few seconds, we were traveling at 100 mph. I became nervous and asked him to please slow down. He did not look at me, but stared straight ahead with a big grin. We were traveling very quickly. Fred went into the fast lane, on the left. I feared that we were going to crash. After traveling several miles, Fred maneuvered the van into the left shoulder of the freeway. We were still traveling at 100 mph. I begged him to slow down. He did not listen. He was enjoying the speed and the power of the van. A few seconds later, he maneuvered the van toward the left and drove onto grass alongside the shoulder, he then continued left and maneuvered the van into a large ditch that ran alongside the freeway. The ditch was about 10 feet deep but very wide. It was also very gradual and was large enough for the van to travel inside of, without flipping. Fred maintained his speed, but then I began worrying that an obstacle would be further ahead in the ditch, or possibly a culvert / entrance pipe would cross the ditch, and we would hit it. I continually begged him to slow down. He did not listen. As I looked ahead, I saw that the ditch was going to end and turn into a field of grass. We entered the field safely. But several hundred yards in front of us, was a parking lot with cars. There were two rows of cars facing inward with their bumpers almost touching. Each row of cars had about 50 vehicles side-by-side. I was hoping that Uncle Fred would veer to the left, or the right, and miss the rows of cars. I begged him to slow down. He slowed to about 90 mph. This was not enough to avoid a catastrophe. I looked down at my seat belt and saw that it was not connected. I then looked behind me, and was surprised to see that I was not alone. My children were in the van. There were also many other children with them. The van was full of children. Seeing that there were children in the van, including mine, increased my anxiety. I told the children to quickly buckle their seat belts, because we were going to crash. They obeyed. I then buckled my seat belt. And prepared for the worst. My heart was racing. I felt the anxiety. I knew we were going to crash. As we get closer to the row of cars, Fred purposely aimed at the middle of the row of cars. This would cause the van to hit the front fender of the car on the left and the front fender of car on the right. Thus, our impact was going to strike the front of both vehicles, and like a bowling ball, the van was going to plow through the middle of both rows of cars. Seconds before impact, I woke up. I was trembling. My heart was racing. Because I wondered if the crash in the dream was fatal. Over the past few weeks, I have pondered and prayed about the meaning of the dream. Several days ago, the Holy Spirit released me to share the dream because He said that the event WAS GOING TO HAPPEN! I do not understand all of it yet. But I do know, I have to share it. So I talked about it in my last audio program. When I did, the election had not yet taken place. But I elaborated that the elements of the dream represented the coming presidential administration. I say this, because many parts of the dream speak for themselves. 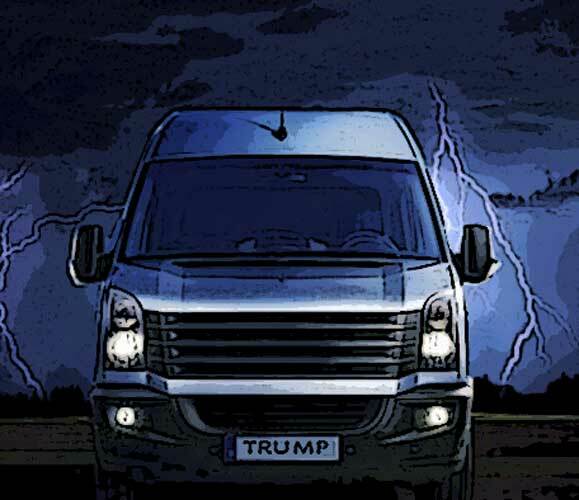 The white van – represents the presidency. The white van had a new engine. I was concerned that because it was new, we had to go easy on it. Because a new engine must always be broken in. Otherwise, it can malfunction. But uncle Fred wanted to experience its power. So he accelerated very quickly. …I believe Uncle Fred represents Donald Trump. Because Donald has several, “Fred’s” in his family. But this raises a question. Why did the dream feature Uncle Fred driving the vehicle, instead of Donald Trump? There could be a number of reasons. And I would like to propose a few possibilities. In the dream, the man was called, “uncle Fred.” I believe that the “Fred Factor,” may be one of the unspoken explanations of Donald Trump’s unique personality, which to many people is an enigma. And to some, an oddity. Many people have wondered about it, and studied it. And while some have concluded that he is bold and brave, others have concluded that he is brash. …and to those who offer an honest critique or appraisal, the summary, is at times, not positive. Because his critics wonder, why he is – the way he is. And in consideration of the, “Fred Factor,” that I saw in my dream. I have a few questions. 1. Was Donald Trump’s personality formed by chance? Or is it complex? 2. Was he negatively imprinted as a child by his father? Or his brother’s death? 3. 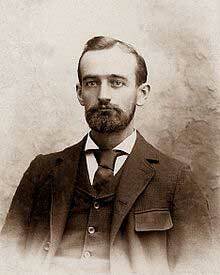 Is the little boy inside of Donald Trump still trying to prove himself to his father, Fred Trump? I think that it is possible. 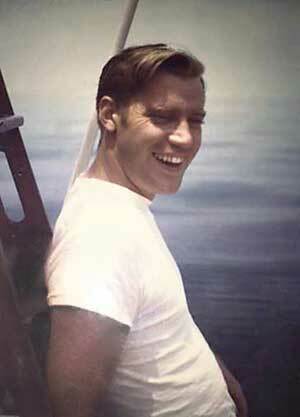 I believe that Donald Trump’s drive for success and achievement may be powered by an insecurity that rests on “unresolved” issues between him and his father, and also the early demise of his brother Fred. Therefore, the memories of several Trumps who are called “Fred” still haunt Donald today. When Trump gave his acceptance speech early Wednesday morning, on November 9, 2016, he thanked his late father Fred, and his late brother Fred. Of course, both mentions could have been totally normal “tributes,” that had no sub-meaning. However, on the other hand, the mentions of the names may speak volumes, and confirm the, “Fred factor,” that I am proposing. In my opinion, I am theorizing that the, “Fred factor,” may have huge merit to explain Donald Trump’s psyche. And if it the theory is true, it means that, Donald Trump may still be trying to please his father, and show his big brother that he has what it takes. It may also mean that there are influential voices of his father and brother, whispering to Donald, which causes him to strive for power and achievement. 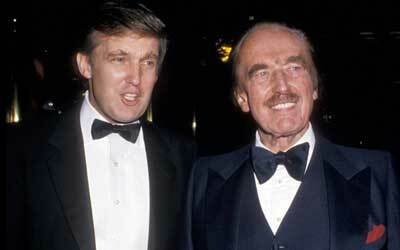 Unfortunately, since both Fred’s have died, Donald Trump’s desire for recognition from them, will never be satisfied. Thus, Donald’s personal and business achievements will never satisfy his soul. …And without the healing of God, Donald Trump will forever be in captivity to the memories of his dearly departed father and brother who are named Fred. In my dream, uncle Fred was driving the vehicle. But it was really Donald Trump. Donald wants power. He wants to feel the power. And now that he won the election, he is going to take the white van (the White House ) for a spin, and see what it can do. As it accelerates, he will steer the administration toward the left. And eventually into the far left. The ditch. The thing about a ditch is … once in it … it is difficult to get out of. I hope that with the Donald Trump presidency, this does not happen. But if this interpretation is correct, this may be what will happen. In the dream, there were children in the van with me. This represents the people of God. God’s children. The evangelicals. Now folks, I know that there is a lot of excitement with many of you who voted for Trump, but I need to share this. Please take it to prayer. And please consider it. First, Donald Trump would not have won the White House without the evangelicals, or God’s children. So the ride that is coming involves God’s people. Again, God’s people got in the Trump van… or the Trump bandwagon. And many of them did it with good intent. They believe that Trump will do a number of things that the church desires; stopping the Clintons, stopping abortion, appointing conservative Supreme Court justices, protecting the Second Amendment, bringing back jobs, and several other things. I do not fault anyone for this. These are noble reasons. So God bless the evangelicals. However, the evangelicals support of Trump also means that the evangelicals are in the vehicle with Trump. And if Trump crashes the vehicle, there will be collateral damage to the evangelicals who are in the vehicle. I know that a number of you may struggle with these words. But my friends, they are true. – If Donald Trump is successful and rises, the evangelicals will celebrate with him. – But what if Donald Trump is not successful? What if he forgets his campaign promises? What if he deviates? What if he forgets the Christians? What will happen to the well-meaning evangelicals? Dearly beloved, this is why I am sharing this dream, and this warning. I am very concerned, that the future is going to include a huge crash. And it is going to involve God’s people. And those who are not prepared for the coming crash are going to suffer harm. In the dream, I warned the children to fasten their seat belts. So I would like to take the time to officially warn God’s people, … brethren please fasten your seat belts, because there is an impact ahead. As uncle Fred drove along the grass, I saw the parking lot in front of us. There were two rows of cars facing inward bumper-to-bumper, like you would see in a grocery store parking lot. I was hoping that Fred would maneuver to the left or the right to go around the cars. But he didn’t. He had a grin on his face. And purposely aimed for the middle of both rows. What does this mean? The left and the right are the political parties of America. 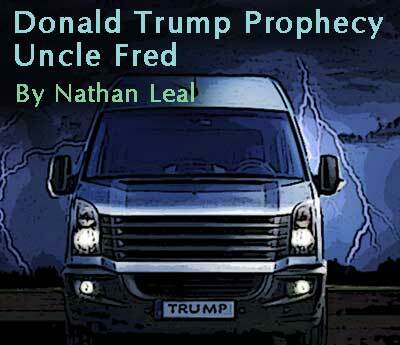 Based on what uncle Fred did in the dream, the white van was purposely aimed at both the left and the right vehicles. In layman’s terms, Donald Trump is going to use the executive privilege of the White House to roll over the Congress and the Senate. This may occur through executive orders, signing statements, mandates, verbal orders, or unilateral decisions. But I do know that the vehicle veered left. It got in the left lane. Then the left shoulder. Then it went into the ditch that was alongside the highway on the left. If the symbolism in the dream represents the political left, this means that Donald Trump will maneuver himself toward the left, instead of the right like he campaigned. As Fred traveled on the left, he eventually crashed. It was purposely. He gained enough speed to plow through both row of vehicles like a bowling ball. This is the part of the dream that is very concerning. Uncle Fred was purposeful. And he had a grin on his face as he did it. What does this mean? Does it mean that Donald Trump is going to exhibit totalitarian behavior in his presidency? I do not understand why anyone would crash a fast-moving vehicle on purpose. Will Donald Trump do this? And what will the ramifications be? What will the collateral damage be? One thing I do know, is it is going to involve Donald Trump and God’s people. So I want to humbly suggest that if you are a child of God, please begin taking the proper spiritual measures to prepare for what’s coming. In other words, fashion your spiritual seat belts. My friends, I know that there is a lot of celebration right now. I understand the “sigh of relief,” that many Christians are feeling, because America dodged the “Hillary Bullet.” But now that she is out of the way, please do not let your vigilance go into a slumber. Many argued that Trump was the lesser of two evils. And while I could spend a lot of time disagreeing, that is now in the past. We have the future ahead of us. And we must now begin dealing with Trump; the man, the mystery, the anomaly. For some – he is the hope. For others, he is the dread. And with this I close. Over the past year and a half, I have been rigorously studying Donald Trump. I have gone back 30 years and examined our future president. I have done this because I am a watchman. And also because the Bible tells us to be vigilant. I have practiced this discipline with both Hillary and Donald Trump. I noticed that most of the evangelicals examined the leaven of Hillary, but bypassed the leaven of Trump. But folks, Jesus said it. I’m just the messenger. And a scale that is just and righteous should never have our thumb on it. I refused to put my thumb on the scale of Donald Trump. And I was persecuted for it by the majority of the brethren. But I must be obedient to God. Therefore, both candidates received an examination. Unfortunately, some of the brethren thought that I had an agenda to steer the election toward Hillary. How they got there, I don’t know. Now that the election is over. Hillary is the past. But the Trump presidency is before us. And based on what I have seen in the big picture of the end times, and in prophetic glimpses about Donald Trump, the coming narrative is not going to be what many of the evangelicals are expecting. Great calamity is coming folks. And it will involve Donald Trump. I am sorry that I have to say it. I am sorry that I must be the bearer of bad news. But I still have to. I know that I am outnumbered. I know that the majority of the watchman are forecasting a vacation for America. I cannot do that. Because I’ve seen too much. I have had 5 to 10 prophetic glimpses about Donald Trump. And those glimpses are not revealing the vacation and good times that others are promoting. They are also not revealing that Donald Trump is safe. I will be talking more about this in the coming days. Buckle your seat belts folks.